Okay, I started a new thread because otherwise there will be too much info going on in the other ones. Below that it lists several versions of the Hauppauge WinTV card, and mine is listed as card 4 and card 5 and card 6. My question is how do I go about telling the system that my card is type 4 (or 5 or 6). I tried searching the insmod info file, but it really just told me to use modprobe instead, and I'm not really sure how to go about constructing the command properly? I guess that I need to tell the system that the address listed at the beginning is a certain type of card. Thats as much as I figured. I have to say its over 10 years since I sat down at a console and properly worked with an operating system and hence my poor knowledge of linux commands. I'll be grateful if anyone can help. I tried to setup mythTV but it says there are no tv cards installed. I checked the wiki before I bought the card, so was hoping that it would just work ootb, but hey ho, my LinxMCE introduction is somewhat bumpy to say the least. I'm going through another clean install again, so we'll see what happens this time, but it hasn't worked on any of the other 3 clean installs this weekend, so I'm not hopeful! Googling the message I get seems to point to the command "bttv.o insmod card=4" but I'm not really sure if bttv.o is appropriate to LinuxMCE. Grr. even if I get this sorted, I still have no audio but I'm trying to work through as many issues as I can. ...have you cycled through the "Card types"? I would have thought that the one shown in that screenshot is the one you'd need. FYI you can do a "lspci" to list your various PCI devices, which I think shows the modules also. You can then use "modprobe" to load the relevant module e.g. "sudo modprobe blahblahblah". But I would have thought that this would be unnecessary for PnP cards. Ok, I found another person on the web with the same problem I have. I tried the things he suggested, but I can't get the command "sudo apt-get install mercurial libncurses5-dev unzip " to work. Maybe something to do with the version of ubuntu?? Anyway it still doesn't work, and I can't get mythtv to appear anywhere on the Linuxmce screen because I was hoping that I could tell the system about the HVR2200 card that way. Where should I look? It could be something to do with the fact that when LinuxMCE loads up, it freezes at 91% saying waiting for other devices to finish starting up #32/MythTV Player. This lasts for about 30 seconds before the black screen pops up telling me that there were some devices that did not correctly start. You can still use it but some functionality will be lost. I'm a bit stuck here to be honest, I've no idea why its not plug and play, and if not, how to set it up. Thanks for the help Mandingo, I did as you suggested, and I just need to read a bit more about MythTV to get it working. I tried the setup, but couldn't get it working, more than likely something that I haven't setup properly yet. 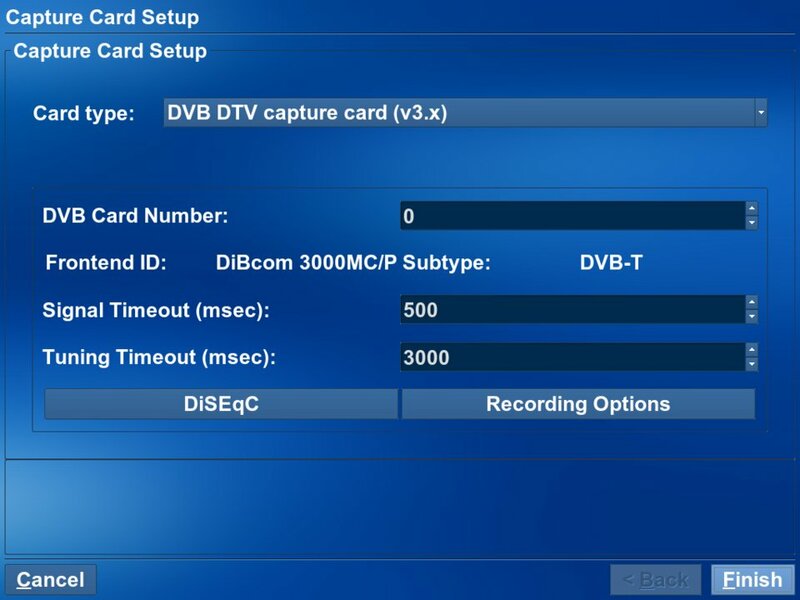 One further question, it showed up in MythTV as a DVB-T card, however I need to use the analogue part of the card. As its a hybrid tuner should it automatically set itself up as both, or is this something I have to setup in the webadmin section? As you can tell its all new to me, but with luck in a few weeks I'll have the hang of it. I jumped into your other thread and posted the required info. Didn't manage to catch you in IRC last couple of times I was in there, been busy with re-installs to get network cards working. Am heading away for xmas and NY, so will try and catch you in Jan. Thanks for all the work you're doing on these cards.